Micro Mag is a clean and minimal blogger template for review or magazine blog. First time from MS Design published a magazine blogger template for free. Earlier some days, we published a newspaper blogger template in our local language Bengali and that was: Songbad 71 - Bangla Newspaper Blogger Template (Premium). After that we now published a magazine style free blogger themes. If you looking for a simple, clean, minimal and responsive magazine blogger template then Micro mag is perfect for your blog. In this template we used top nav and drop down responsive main menu. In top menu bar used breaking news ticker. In this template we used some awesome and beautiful features that make your blog more professional. Micro Mag is a free magazine blogspot themes. It is a premium blogger template. But always we also publish a version of every templates. So, you can download this awesome template for free but premium version is also available. The minimalist design of this template are eye flashing. Recent posts slider and Carousel are also available in this template and finally mag style layouts are make you comfortable. In this template Facebook and Blogger comments both are used. Users can easily describe their opinion with their chosen platform. 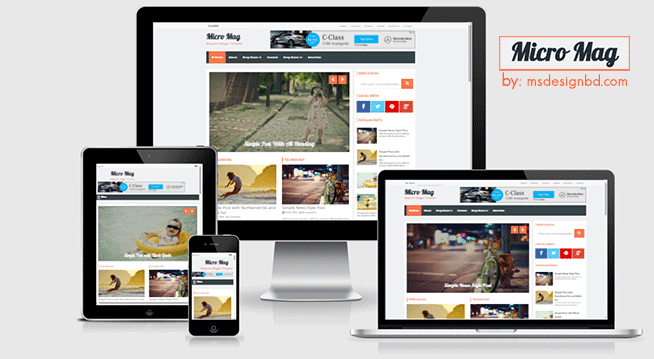 Micro Mag is a 100% pure responsive blogger template. Just see our previously released all templates. Micro Mag is also responsive which indicated that your website looks great on smartphones and tablet as good as they look on desktop devices. This template is compatible with all device. Responsive and mobile friendly blogger themes are most important ins search results. So, use a proper responsive blogger template in your blog. A mobile friendly blogger themes play an important role. Cause maximum of visitors are come from mobile. So, its too much important to make your blog mobile friendly. Google also like a mobile friendly blog. Micro Mag is optimized for for search engine up to 100% SEO score. It is becoming our standard. Our all templates are search engine optimized for better performance in search result. After all, micro mag magazine template is highly optimized to work great and help you to rank better in search engine. Use this template and see this awesome performance of this template. Recent posts slider and Carousel slider is the another great features of this template. Slider placed in top of the content wrapper. It is the best place for slider. 10 recent posts are automatically display on this slider with post title. You can change the number of posts from 10 to with your own. Recent posts Carousel is worked with specific label. You can display a specific label's posts using carousel slider. All mag layouts are also work with specific label. Just open all mag widget from layout and type specific label name. We always try to make all easy. In earlier, if you used our template, then you can say what easy our admin panel. Micro mag is other one. In this template, you have don't need any coding knowledge to customize template. Just open widget and type any label name, that's it. Micro Mag is perfect choice for many types of simple review or magazine blog. It will be a ideal template for who wanna start such a blog. Go to layout and Edit slider widget and type recent and save widget. Now it will be display 10 recent posts. I want to use free version, then what is demerit of this one. I wait for your kindly reply.